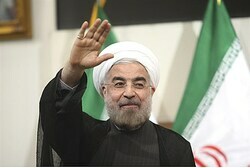 In the speech Wednesday commemorating the 35th anniversary of the Islamic Revolution, Iranian President Hassan Rouhani once again turned on the “charm offensive” against the US, insisting that Iran does not want to attack any country. The Islamic Republic later emphasized that the Iranian army’s response to attacks against the Islamic Republic would be fast, harsh, and devastating. Tensions between the West and Iran continue to escalate, especially with the US. Ayatollah Ali Khamenei verbally attacked the US last week, calling it “controlling and meddlesome” and taunting that it is unable to topple the Islamic Republic. Hours earlier, the Islamic Republic’s Revolutionary Guard issued threats, warning the US that its drones and missiles could reach American vessels in the Persian Gulf. Then, this week, Iran publicly announced that it had successfully tested two new missiles, both designed to take out long-range targets. The announcement prompted Foreign Minister Avigdor Liberman to warn the world on Tuesday that Iran’s intentions have become more and more bold against Israel and the West, and not to rely on a false sense of security garnered by ongoing talks. “The new missile tests conducted by Iran yesterday are further proof its intentions have not changed and the Iranians are not even hiding their being a warmongering state,” Liberman declared. Report: 10% of Israeli children go to bed hungry Number of reported abuse cases involving children jumps from 14,513 in 2006 to 17,677 in 2015.